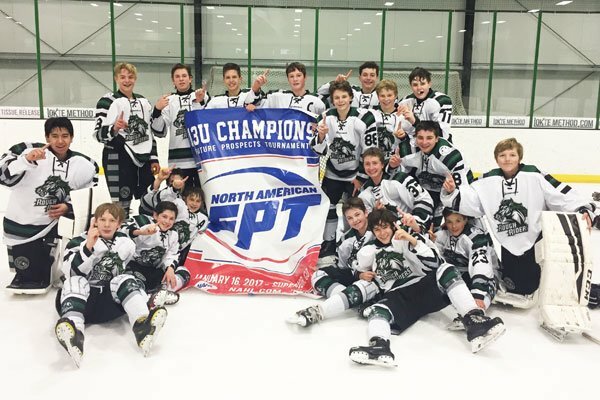 There was no place like home for the Rocky Mountain RoughRiders’ 13U AAA team during the North American Hockey League’s Future Prospects Tournament (FPT) from Jan. 13-16. Playing most of their games at the Sport Stable in Superior, the 13Us ran the table, going 6-0 over the weekend. The RoughRiders defeated the Arizona Bobcats for a second time over the weekend, 2-1, to take the division championship at the FPT. Slade Streeter and Zane Pickel (power play) scored first-period goals and Miguel Tanner stopped 24 shots. The Roughriders had previously edged the Golden State Elite Eagles 1-0 in the semifinals by following a similar formula. Nicholas Yard scored a first-period goal and Tanner posted an eight-save shutout. After an opening 4-2 victory over the San Diego Jr. Gulls, the RoughRiders edged the Evolution Elite Hockey Academy 6-5 and posted three-goal victories over the Bobcats (5-2) and Golden State (7-4). Pickel led the team with 10 points and seven goals in six games. Sean Wilson added eight points (five goals) and Hogan Boyle had six points. Tanner allowed a total of four goals in his four starts and had a .917 save percentage. That the tournament triumph came at their home rink was icing on the cake.